How many times a day do you call your dog? "Here, Phoebe!" "Phoebe, come!" You call them when it's mealtime, you call them to go for a walk or get in the car, you call them back to you when they're off leash, you call them to stop tip toeing through your flowers or to come sit with you on the couch. "Phoebe come back here, get away from those flowers!" After awhile your everyday dog training Recall command may lose it's sense of urgency. In an urgent scenario, your typical "Come" training command for dogs may not be strong enough. Let's say an irresistible squirrel is perched on your front lawn, taunting your poor dog. As you open the door to retrieve the mail, your dog door dashes and lays chase! The offending squirrel then dashes across the street with your precious pooch in hot pursuit, just as a car is careening down your street! You call him to you frantically, but your dog has tuned you and your boring "Come!" command out. It's a disaster in the making. For situations like that, it's critical to have an Emergency Recall Command in addition to your everyday Come! recall command. The difference is that teaching your dog an Emergency Recall Command in addition to your regular Come When Called command makes the emergency recall command one that is reserved for more extreme situations like a speeding car or a vicious dog approaching. My Emergency Recall Command for Icy and Phoebe is "DANGER, DANGER!!". Whatever my dogs are doing, wherever they happen to be, they stop and immediately come running. Why? Because they know that along with those two magical words comes delicious.... BACON! It is the only time my dogs ever get bacon or bacon flavored anything. That makes bacon their most highly valued treat. They come running because they never know when they might ever get that delicious bacon again. Icy is enthralled with whatever lurks behind the garage. Don't ask me why, personally I think it's kind of gross back there. She is always reluctant to come out, and sometimes I need to call her a couple of times before she'll emerge. It's a great opportunity to practice our Emergency Recall training. In the video above, you can see how she responds to my Emergency Recall. I never use the Emergency Recall unless I'm reinforcing that particular dog training command, and of course if there's an urgent situation. Thankfully, I only had one urgent situation, when Icy got loose as I dropped her off for boarding. In a nano-second, she ran and was barreling towards the door to the parking lot! I quickly yelled our Emergency Recall Command, "DANGER, DANGER!! ", stopping Icy in her tracks, sending her running back toward me. I breathed a huge sigh of relief and nearly bit off the head of the poor employee for letting her slip out of his grasp. Training your dog to respond to an Emergency Recall Command is just like teaching any other command. Find one thing you can use as a super high value reward that you will only use for Emergency Recall. A treat, a toy, whatever will seriously float your dog's boat. 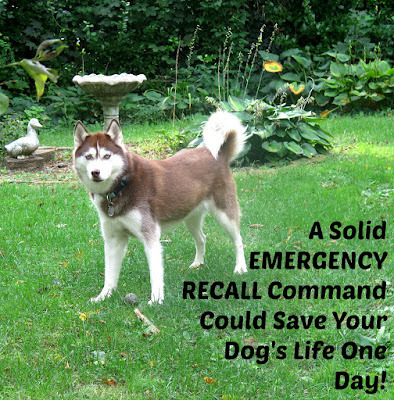 An emergency recall is one of my dogs most valuable obedience commands. ﻿﻿Your command can be anything at all. Just make it a unique word or phrase you won't use for anything else, and one your dog isn't likely to hear from other people. It should be short, one or two words. Say your Emergency Recall Command and immediately reward your dog with the high value reward you've chosen. Do this a number of times until your dog gets it. Continue practicing in various places where there are distractions. Once it's solid, continue to reinforce the training with your dog every now and then to ensure he remembers it. Don't practice too often, keep it special and unique. Does your dog have an Emergency Recall Command? What do you think about having an Emergency Recall Command, separate from your daily Come command? Leave us a comment, we always want to hear your thoughts! Wow! What a great idea!! I suppose I sort of have an emergency recall command, although its not really recall, but it helps when I need to get their attention off of a squirrel running by or something to that effect. "Leave it" works wonders for me, and yes, I give a high value treat in those situations. I never thought of it as my emergency recall though! Great great post! So glad you like the post! Leave It is another fabulous command. It restored harmony in our home; stay tuned for my video & post on that one later this week! If Leave It works for you as an emergency recall as well, that's great; two birds w/ 1 stone is always a good thing! Thanks for your valuable feedback Jenna! The Recall command is definitely a lifesaver. Too often we forget to practice it but it should be practiced on a routine basis...just like having a fire drill to stay safe. WORDLESS WEDNESDAY: Dogs In Carts! What Should You Do If Your Pet Goes Missing? Apparently Dogs Can Climb Trees!